I only finished this linen tote bag this week and promptly gave it to my daughter as a birthday present. 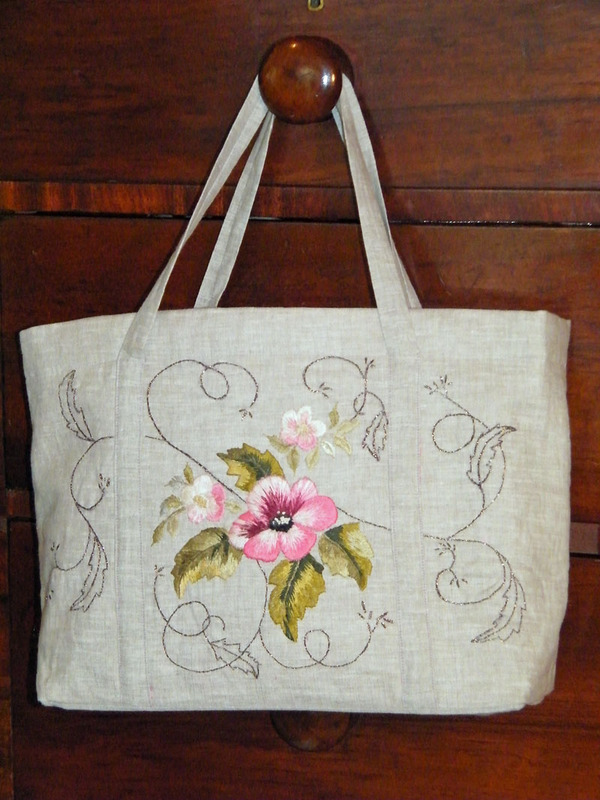 It had been my "go visiting" piece of embroidery for a while - nice and small for carrying to a friend's house for an afternoon or evening of embroidery. So now it's on to other projects. Must think about more tote bags. They're fun to do and make a pretty but useful present. It's been raining steadily overnight and again this morning - would be a perfect day for sitting and sewing but it will have to wait for a while - perhaps this afternoon. Thats a very cute but simple tote bag. Do you make tote bags? Or are you just doing them for your daughter? Let me know. This is the only the second one that I've made. But I plan to make a few patchwork style totes to use in place of wrapping paper for Christmas presents for the female members of the family. By then no doubt I'll be ready to move on to some different form of handwork.